Aaawww aint love grand! Expressing your love for that special someone in your life should be a regular occurrence... however if you struggle in that department, have no fear as you can take advantage of that one day of the year to share that love! Valentines Day needn't be an over expensive chore, especially when we have found some cracking promotional codes to save you a few pennies when it comes to wooing your love interest! It's supposed to be the thought that counts rather than the presents... but flowers and chocolates will give you a few brownies points! So let us be your discount code cupid and offer you the tools to say 'I Love You!' without breaking the bank! 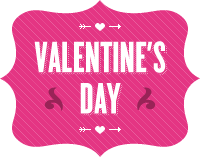 Don't be shy and go grab yourself a Valentine's Day inspired promotional code and treat the object of your affection!